Tonight, though, we are GOING TO SEE HAMILTON. And also it is going to be 50 degrees and we are going to have a fabulous dinner beforehand. I have been looking forward to this night for so very long, and I’ve already heard great things about the tour we’re seeing. It feels like an awesome time of year to get to see such a special show – chilly and decorated downtown and everything feeling so very festive. Festive like these! 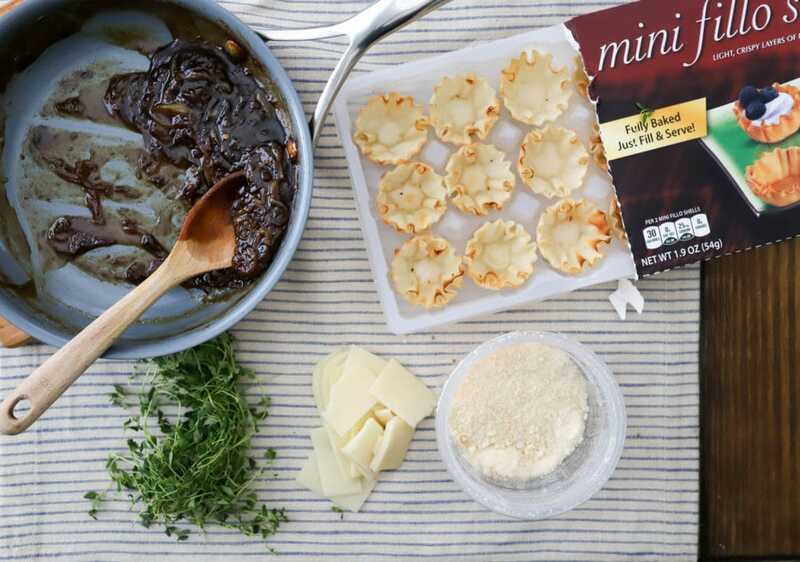 French Onion Fillo Bites, and get off me about how to spell it. There are three (maybe more) spellings used interchangeably on the internet and the box of pastry cups I used say Fillo, so that’s what we’re going with. 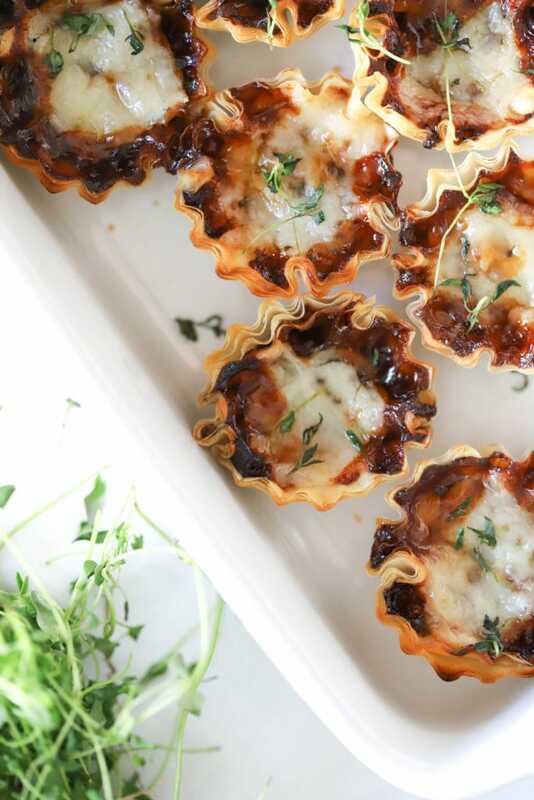 These are super simple and involve a wildly delicious caramelized onion filling topped with sharp cheese. 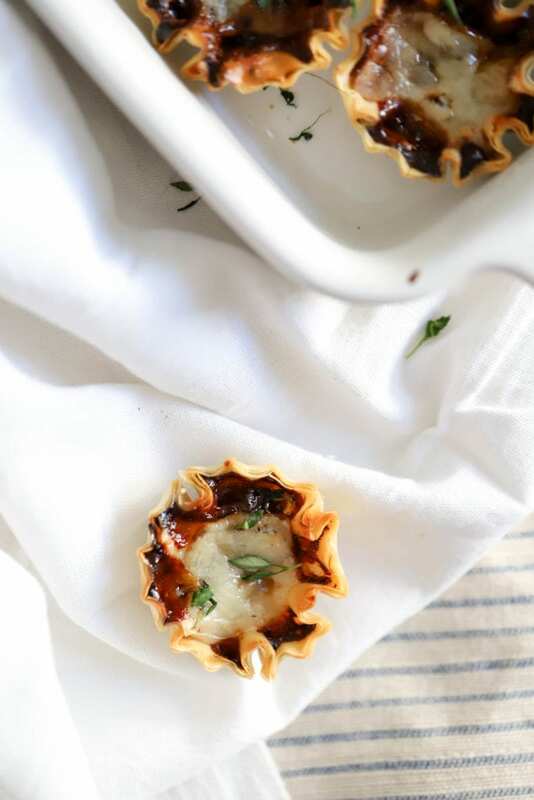 That is stuffed into premade pastry cups (that I love using this time of year) and baked, and everything gets ooey gooey and just makes the most delicious one-bite snack. I love these for parties or as a starter to a fancier meal, and honestly keeping some of the onion mixture around to spread on crostini wouldn’t be a terrible idea at all. Start with making the onion filling. 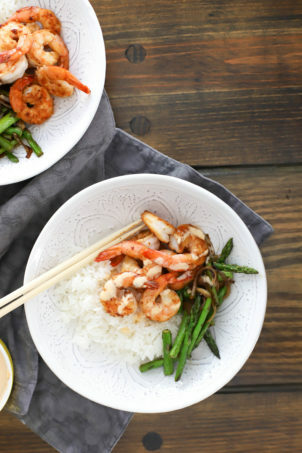 This takes about an hour, but can be made well in advance and is super easy even though it takes some time. You need! Sliced onion and beef broth, onion powder, garlic powder, crushed red pepper, salt, and Worcestershire sauce. 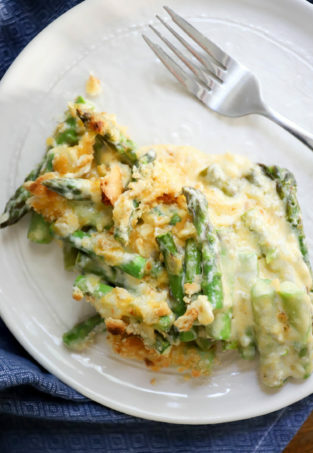 Place all of the filling ingredients in a skillet with a drizzle of olive oil and turn the heat to medium-high. Cook the onion mixture downdowndown, letting it bubble and reduce as it cooks. 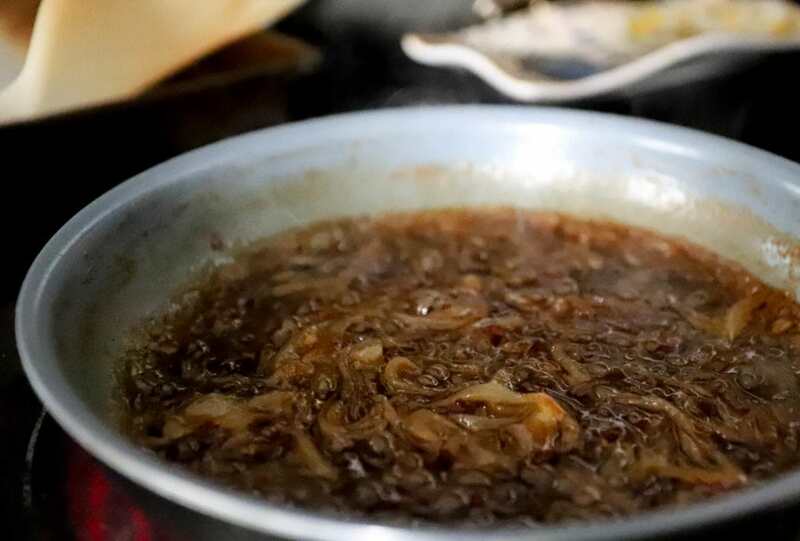 This’ll take about 45 minutes, and the idea is that as the beef broth evaporates the onion will cook down and become super flavorful, like a quick version of caramelized onions. When the onions are super soft and there isn’t much liquid left in the skillet, turn the heat off the onions and let them cool slightly. 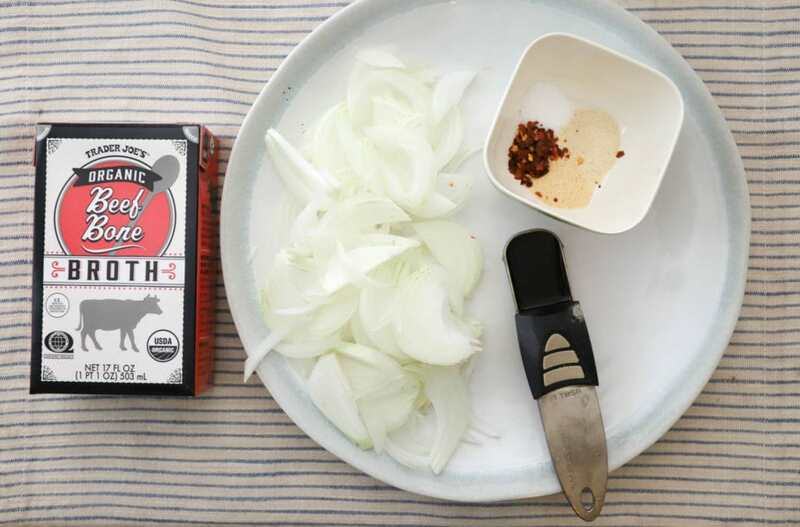 When you’d like to assemble the fillo bites, grab the rest of your ingredients. 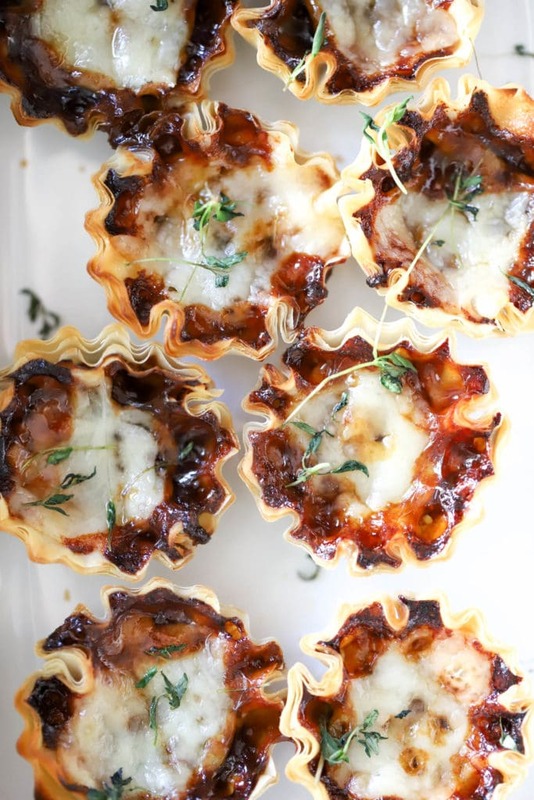 Frozen fillo cups, parmesan cheese, gruyere or other melting white cheese (this is two deli slices of Roth’s Grand Cru cut into 8 pieces each), fresh thyme, and the onion mixture. 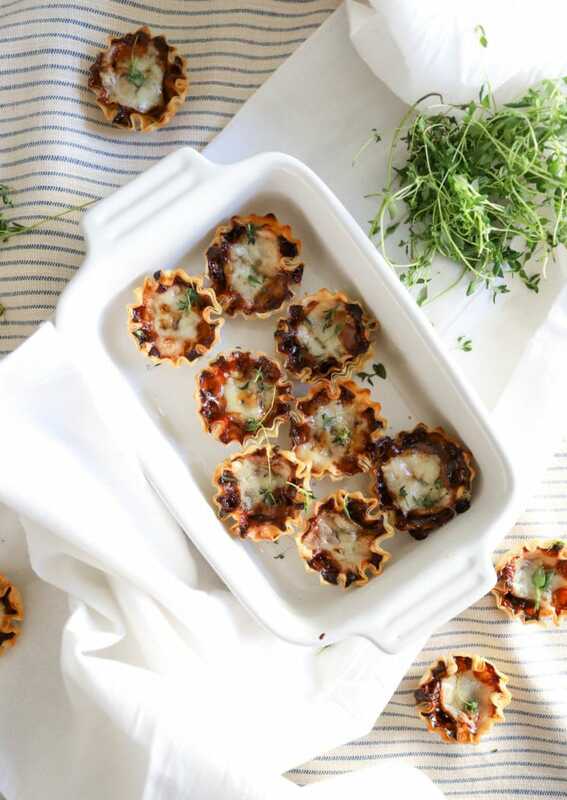 Turn the oven to 375F, and arrange the fillo cups on a baking sheet or in a small dish before filling them. In each one, layer a bit of parmesan, then a teaspoon or so of the onion mixture, then two small slices of melting cheese. 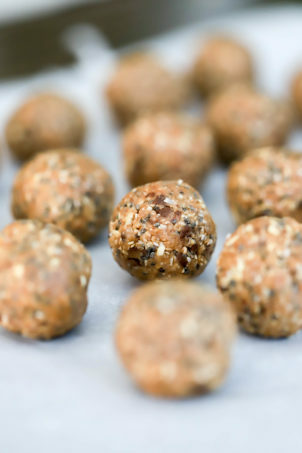 Use all of the ingredients without overfilling the fillo cups – leave a tiny bit of space at the top of each one. Bake the cups for 20 minutes or so, just to melt the cheese and heat everything else through. Top with fresh thyme, and DONE. I like to prepare the ingredients for this and bake the cups right before a party starts, or if I’m going someplace where I know the host well enough I’ll bake the cups at the actual party (if it’s not at my house). These are wonderful room temperature, and really delicious hot from the oven, so serve them however works best for you. Flavors include nostalgia: Panera or wherever else you got your middle and high school overly salty French onion fix growing up, soup packets made into dip, that sort of thing. I’m all about old flavors turned into something a leeeeetle bit more sophisticated, and these do just that without a ton of effort. They ARE pretty spicy from the crushed red pepper, so leave it out or just use a few pinches if you aren’t into lots of heat. In a small skillet, add the onion, beef stock, spices (except for the fresh thyme), and Worcestershire with a drizzle of olive oil. 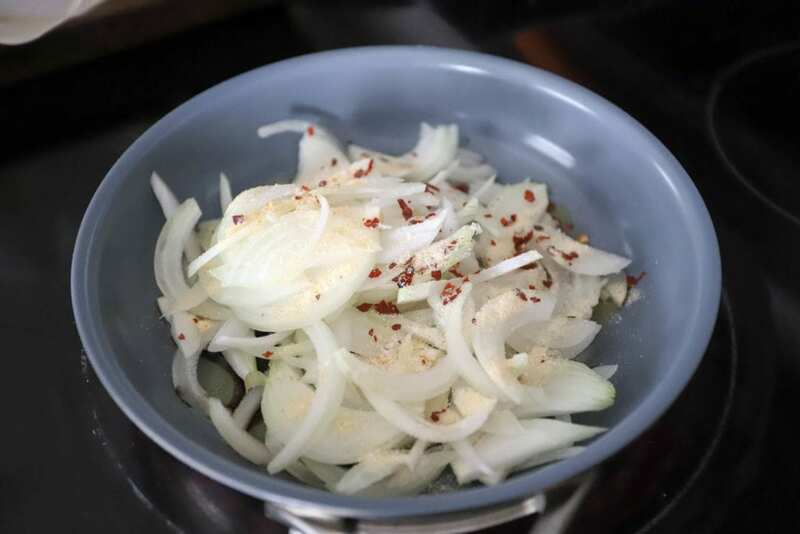 Cook the onion mixture over medium-high, stirring occasionally, until the onion is very soft and most of the liquid has evaporated. This will take about 45 minutes, more or less depending on your stove and the skillet you use. 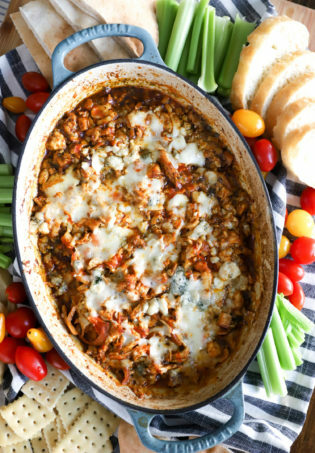 A nonstick skillet works great for this! 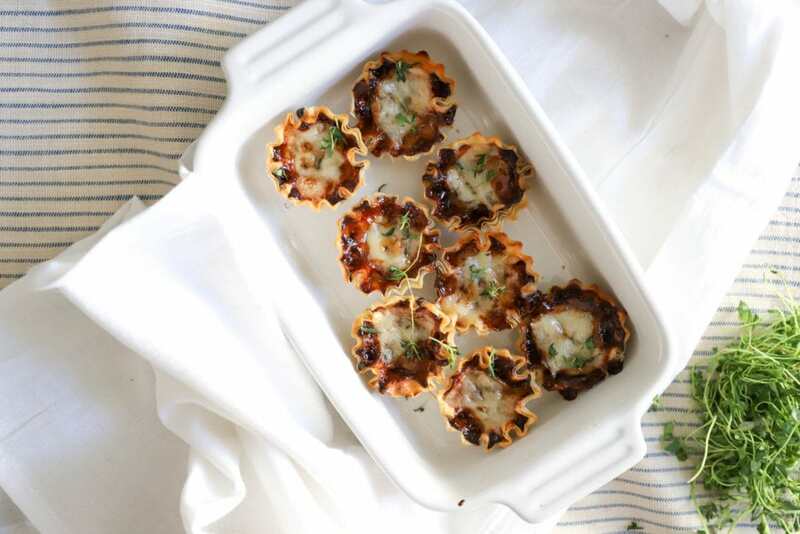 Cut the cheese slices into 8 pieces each – enough to yield two small squares per fillo cup. 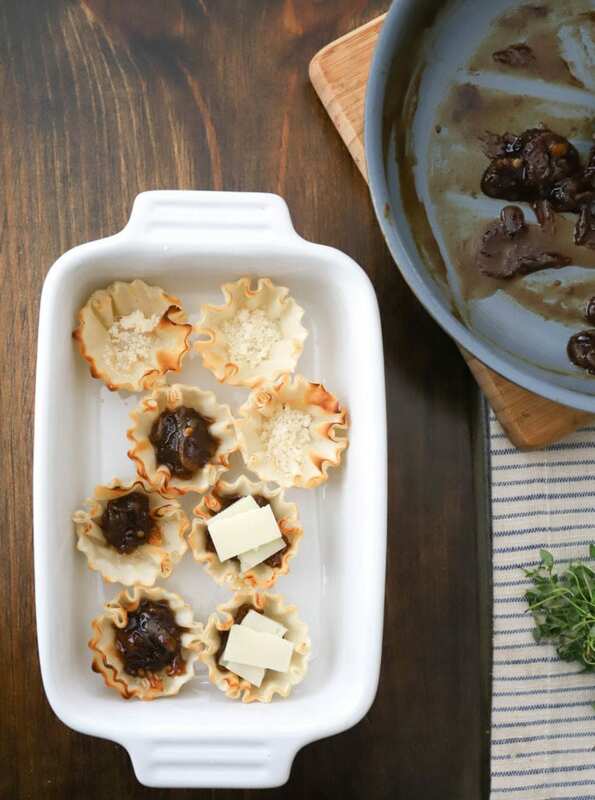 When the filling ingredients are prepped, preheat the oven to 375F and fill the filo cups. Place a small amount of parmesan cheese in each cup, followed by about a teaspoon of the onion mixture (use it all up!). Top each cup with two small pieces of melting cheese. 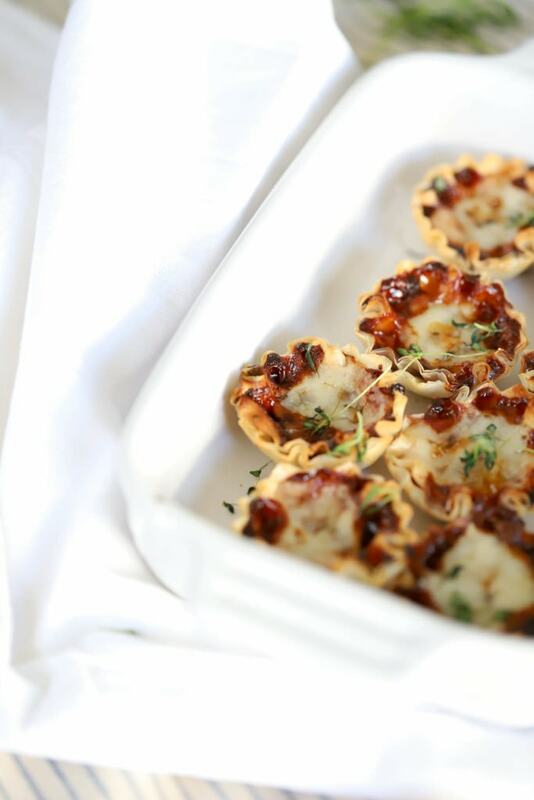 Bake the cups for 20 minutes until the cheese is bubbly. Top with fresh thyme leaves and serve hot. For potluck events, I bake these right before I leave and serve them at room temperature, or assemble them and bake them at the host’s house if appropriate. Previous Post: « About a Beck! 3 years.